Last weekend Derek Brabender and I travelled to Princeton, Minnesota for Carvorama. Organised by Yuri Moldenhauer it's a fun get-together for green woodworkers. Coming in from Madison, WI, about a five-hour drive, I'd guess we were from the furthest away. It's at a great time of year for an event like this, probably the first of the year. In the Midwest at least. 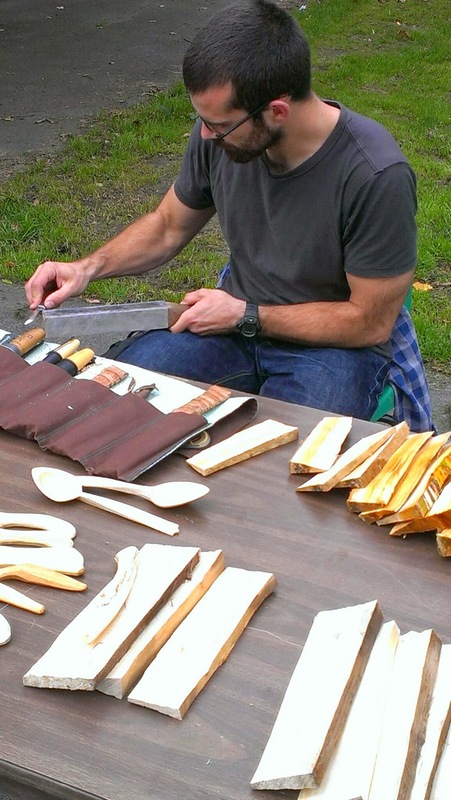 This is a question I get asked quite often, so I want to take the time to talk about the tools, materials and other resources you can use to get started with spoon carving. 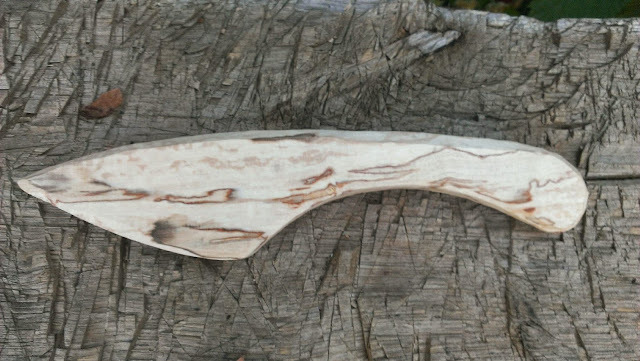 I've already written about why you should carve a spoon and I won't spend much time talking about the actual techniques involved in spoon carving. This article is more of a primer on what resources to gather if you want to start making spoons. This is probably the most asked question. 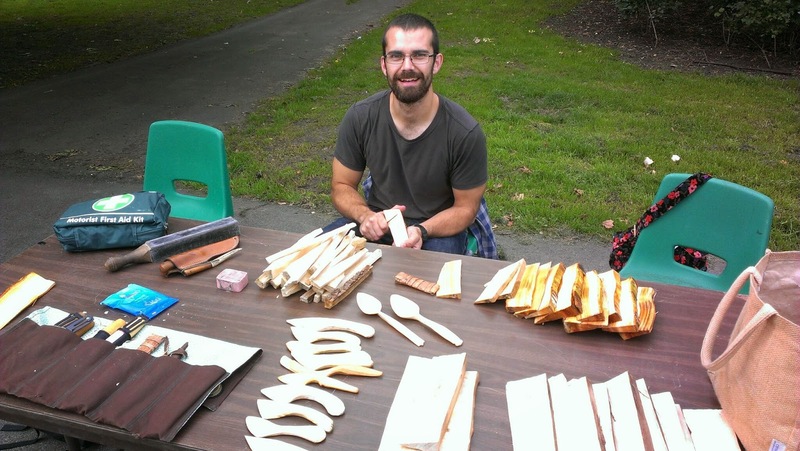 The fantastic thing about carving wooden spoons is that the tools you need are very basic. Most simply you need a saw and several sharp wedges (an axe, a knife and a hollowing tool). There are lots of very similar options out there so I will stick to the best option that most people are going to be able to source. If you have an alternative tool you prefer over my suggestions, please share in the comments section below. I would recommend a raker tooth saw. The raker tooth saw is for cutting rounds from larger green logs. The advantage of raker tooth saws is that they clear away wet saw dust better than peg tooth saws. Make sure that the saw is big enough to cut through what you've got. This tool will do the heavy duty shaping of your spoon, removing most of the material that isn't spoon shaped. With practice you can get quite close to your final shape with just the axe. Probably the best axe for starting spoon carving is the Gransfors Bruks Wildlife Hatchet. It's light enough that anyone can use it without getting too tired. The quality of Gransfors' tools is exemplary and the edge geometry of the axehead is well suited to carving. 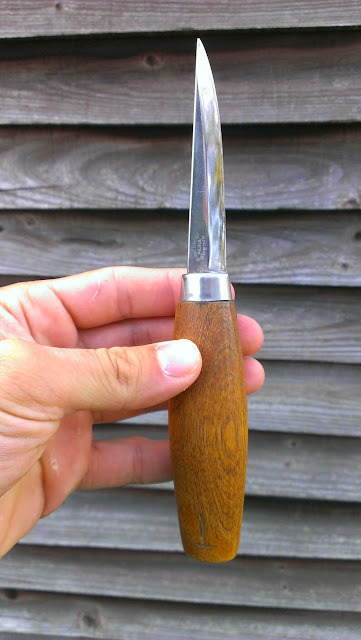 The absolute best spoon carving knife for your money is the Mora 106. The long blade allows for powerful sweeping cuts. The thin tips lets you carve tight corners and the laminated steel holds its edge well. It's inexpensive and widely available. 'Nuff said. This is the one tool where I'm going to give several options. I use the Hans Karlsson spoon knife. I really like the open sweep and the size is great for a wide variety of spoon bowls. I would advise staying away from the Mora spoon knives (162 and 164). The grind isn't great, the 164 has a useless and frankly dangerous point at the end and the two edges of the 162 stops you from using several very useful grips. I've also used spoon knives from the following makers, and I highly recommend them: Nic Westermann, Dell Stubbs, Svante Djarv, Robin Wood and Ben Orford. *Update* Morakniv have changed the grind on the new 164S and 162S. I haven't had a chance to use either myself though. 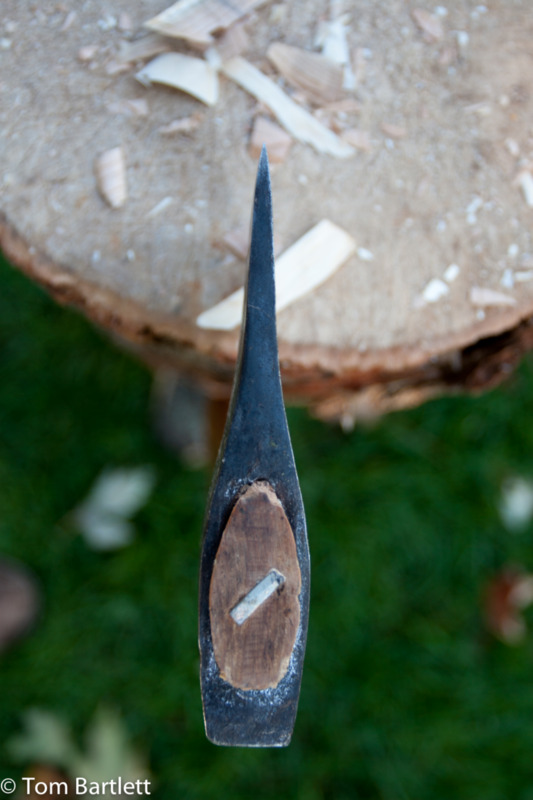 Using hand tools to carve spoons is best done with freshly cut 'green' wood. 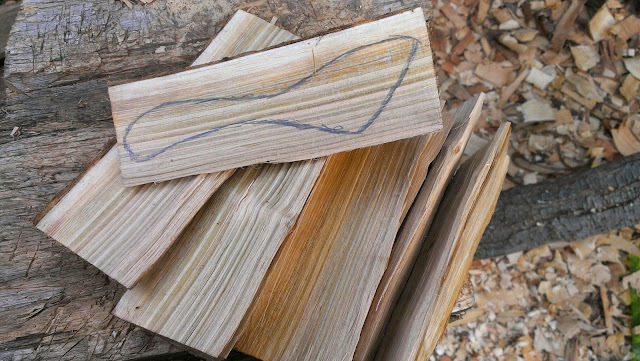 Recently felled wood is easier to carve but sourcing it is a little trickier than getting your hands on dry wood. Contacting local tree surgeons, parks and nature conservation organisations is a good place to start. 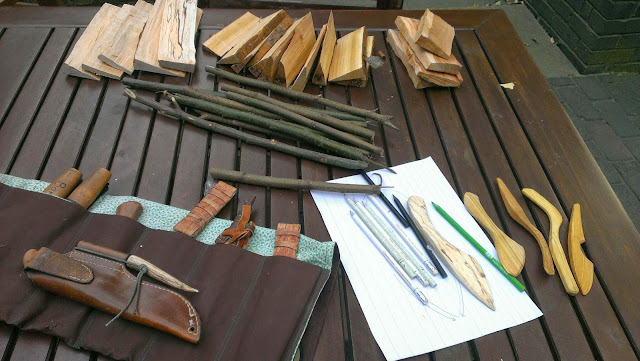 While almost any hardwood is suitable for making spoons I would recommend starting with birch. Birch is a fast growing genus common to many parts of the world and easy to identify from its often white, peeling bark. The wood is easy to carve, but hard enough to give a good finish once it dries. It is a lovely pale golden colour, without much difference between the heartwood and sapwood. 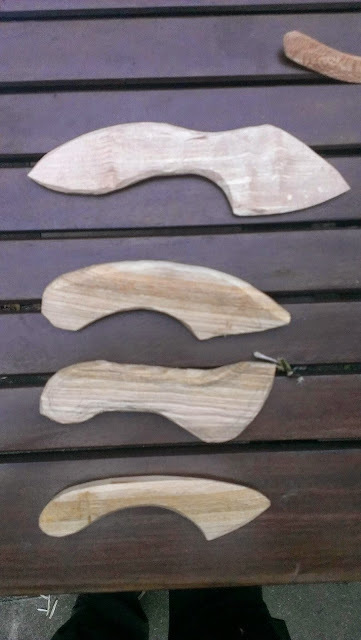 I would however encourage beginners to try as many different woods as they can as even within different parts of the same tree there can be variances in how well a piece carves. I opened up a cherry log. It really useful to make a couple of wooden wedges before starting the split. The wedges help split the log, and won't damage the axe if they come into contact. 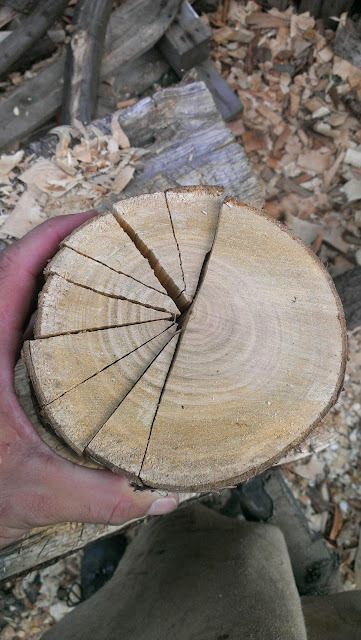 I split the log into ten sections, ready to be turned into ten cooking spoons. By the end of the morning I had ten spoons roughed out. 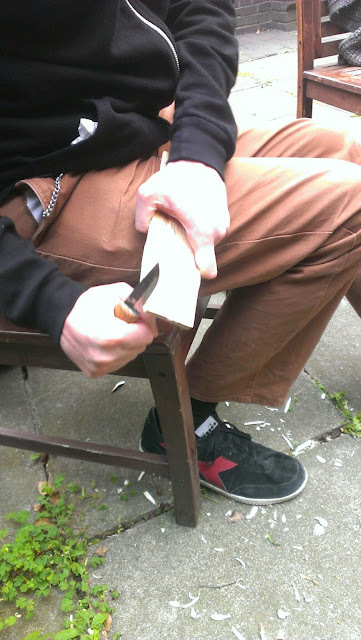 I used my adze to help speed up hollowing he bowls out. The twca cam also quickly removes wood from the bowl, and I find it easier to get a smooth finish. I've got five pretty much finished, with a few minor refinements still needed. I am really surprised with the variation in colour between the spoons, especially as they're all from the same log. Probably the best wood working knife out there at this price. Our woodcarving knives are well known and appreciated precision tools that are used by wood carvers in Nusnäs, for example. This is where one of Sweden’s most recognized national symbols – the Dala Horse – is carved. 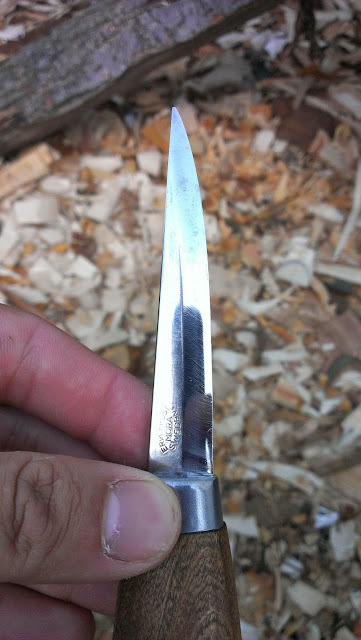 The Mora 106 is a brilliant woodworking knife, whether you’re a seasoned veteran or just beginning. The first thing that I think makes the 106 great is that it’s a cheap knife, but is top quality. The laminated steel blade takes a razor’s edge without a great deal of effort, and holds it. 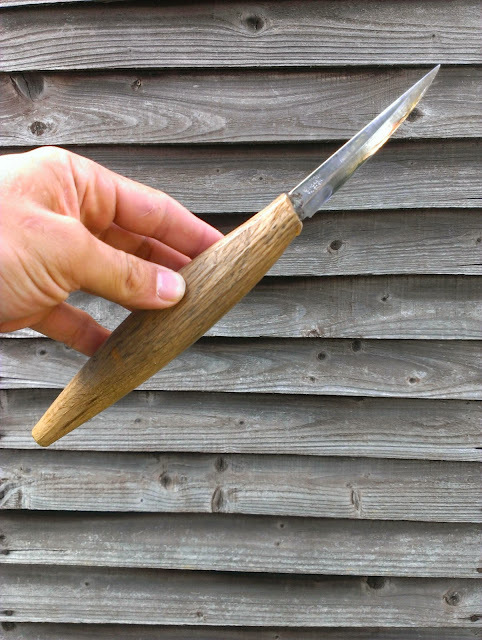 The barrel shaped birch handle, whilst plain, is comfortable to hold in a variety of grips. The shape of the blade is really what makes it a winner for me. It tapers to a thin point, great for delicate curves or kolrossing. The stick tang goes all the way through the handle, allowing you to make bigger, more powerful cuts. 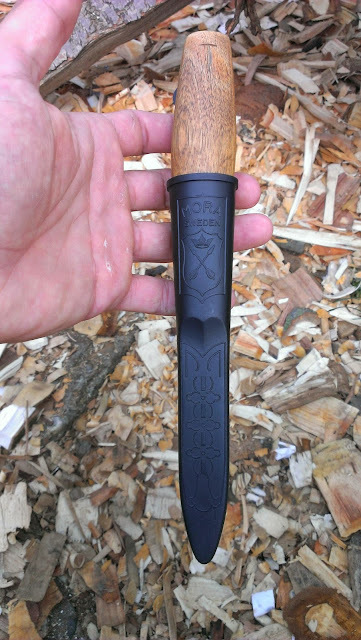 I prefer this longer, thinner blade to the Mora 120 (another great woodcarving knife from Mora at a similar price). The plastic sheath supplied with the knife is cheap and cheerful, protecting the edge but with no real style or grace. If the knife isn’t pushed solidly enough into the plastic sheath it can fall out. If the knife if wedged in too tightly, just trying to pull it straight out can be dangerous when the sheath suddenly releases its grasp. A much safer way is to twist the handle, jiggling it as you gently pull it out. 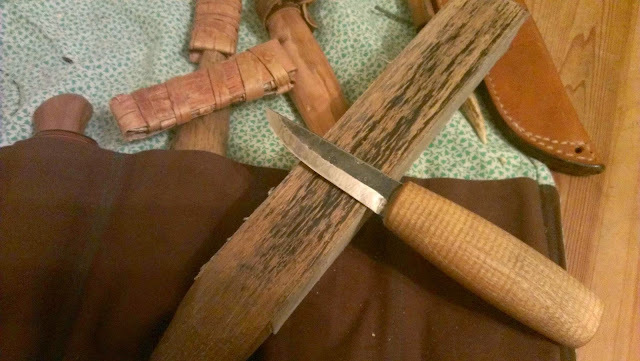 The birch handle is symmetrical, which means you can’t tell where the edge of the blade is by just gripping the handle. If you’re paying attention to what you’re doing, this shouldn’t poise a problem. However I have rested my thumb on the edge of the blade by accident on a couple of occasions. However, the handle is easily customized. The 106 blades are also available without a handle, allowing you to make your own. 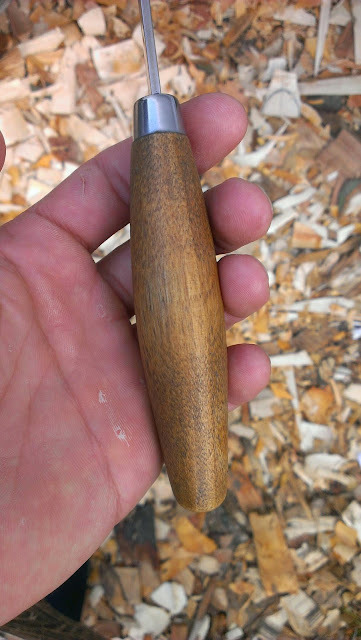 106 blade fitted into an oak handle I made myself. 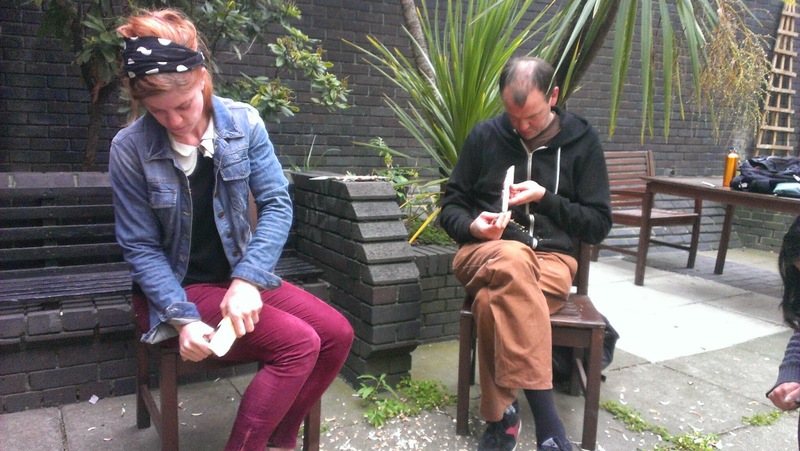 I recently held a couple of carving workshops in London. One near Old Street and another in Victoria Park. Both of them were great fun and they kind of surprised me with how eager people were to learn crafts. Both of the workshops were a part of Keep Britain Tidy's Waste less, Live more Week. The week was themed 'Be Resourceful' with daily challenges. The first challenge was 'Make it' and that was where my workshops came in. While I spend most of my time making spoons, butter spreaders are a better project to start with as they only need a knife and are less complicated objects to make. I split billets of cherry ready for the event. I also brought along some thin sticks for people to practice the various cuts with. 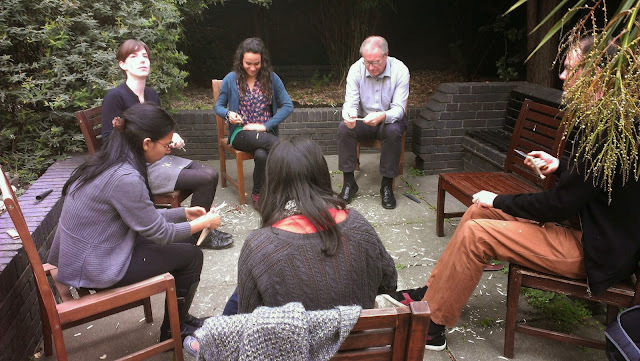 For the workshop in Old Street, I took bookings and the seven spaces available filled up very quickly. Very impressed by some of the work they were able to produce in the short time available to them. The Victoria Park workshop was slightly different. There's a patch of land currently being turned into an outdoor classroom/community garden. I was there to help encourage people to get involved in that project. I was set up next to one of the park's entrances and sat there whittling away to get peoples interest. Over the course of about three hours I had seven people take part in some carving. Three of them were children, whose behaviour and attention to instruction I was very impressed with. 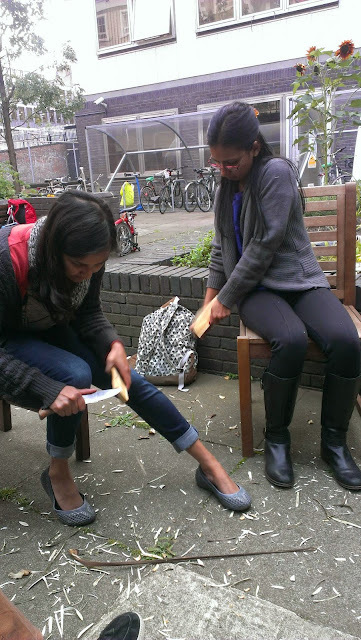 It did feel a little strange to be in east London handing out knives to people! 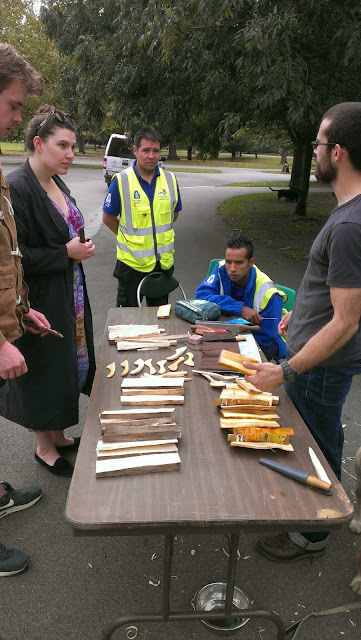 Fortunately we didn't have any accidents, just several happy folk who now know a little more about woodwork! 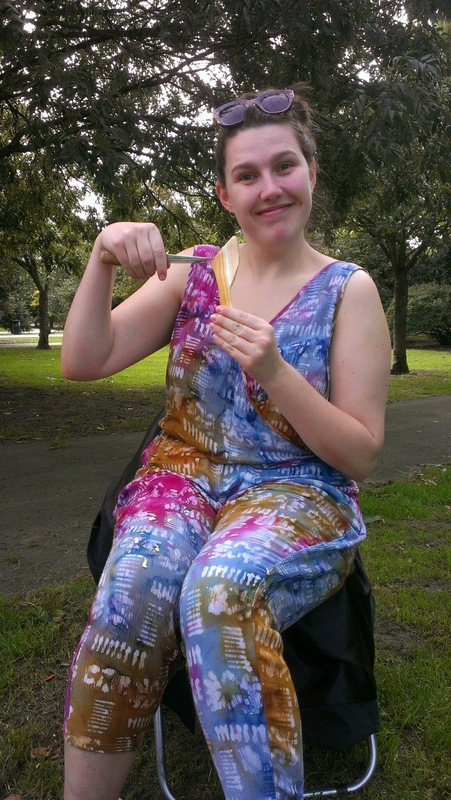 The workshops in Victoria Park might become a regular, monthly event, so if you live near there, let me know and I'll send you the details of the next workshop once the details have been sorted out.